Russia on Tuesday blamed Washington for the looming collapse of a key arms control deal after fresh talks failed to reach an accord to save the Intermediate-Range Nuclear Forces Treaty. 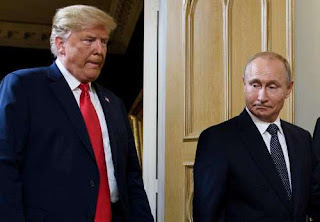 "Responsibility for this fully and completely rests with the American side," Russian news agencies quoted deputy foreign minister Sergei Ryabkov as saying after the talks in Geneva. Ryabkov, who led Moscow's delegation, said the parties had failed to agree on anything and Washington did not appear to be in the mood for more negotiations. "We are forced to acknowledge that there is no movement forward," he was quoted as saying. The US side said the meeting in Geneva was "disappointing." Ryabkov slammed the US negotiators for their "uncompromising stand". He said Americans had confirmed Washington's intention to exit the treaty from February 2. He said Russia proposed holding another round of talks on the agreement but got no reply from the US side. "We are ready for dialogue on the basis of equality, mutual respect, (and) without putting forward ultimatums," Ryabkov said. On Friday Russia plans to brief European diplomats on the status of the talks, he said. Tensions have risen over the fate of the INF, with Russian President Vladimir Putin threatening a new arms race if the agreement collapsed. Putin in December suggested he was open to the idea of other countries joining the INF treaty or to starting talks on a new agreement. The bilateral agreement -- signed by Ronald Reagan and Mikhail Gorbachev in 1987 -- forbids ground-launched short- and intermediate-range missiles.